You can enjoy the convenience and great taste of draft beer anytime and almost anywhere inside or out, thanks to Marvel's complete line of draft beer dispensers. It's the ultimate in home entertaining, style, and luxury: fresh, cold beer, wherever and whenever it's needed. The Marvel Draft Beer Dispenser line hides kegs from sight while keeping them cold. This model can be used for both Undercounter or freestanding applications. To dispense two kegs you will need to use 5 Gallon Kegs. This kegerator can also accommodate either a half or quarter keg. The Marvel ML24BNP2RP-X2D features a black cabinet with a black overlay door and is designed for inside applications only. The overlay door accepts a custom wood panel to match your surrounding cabinetry. 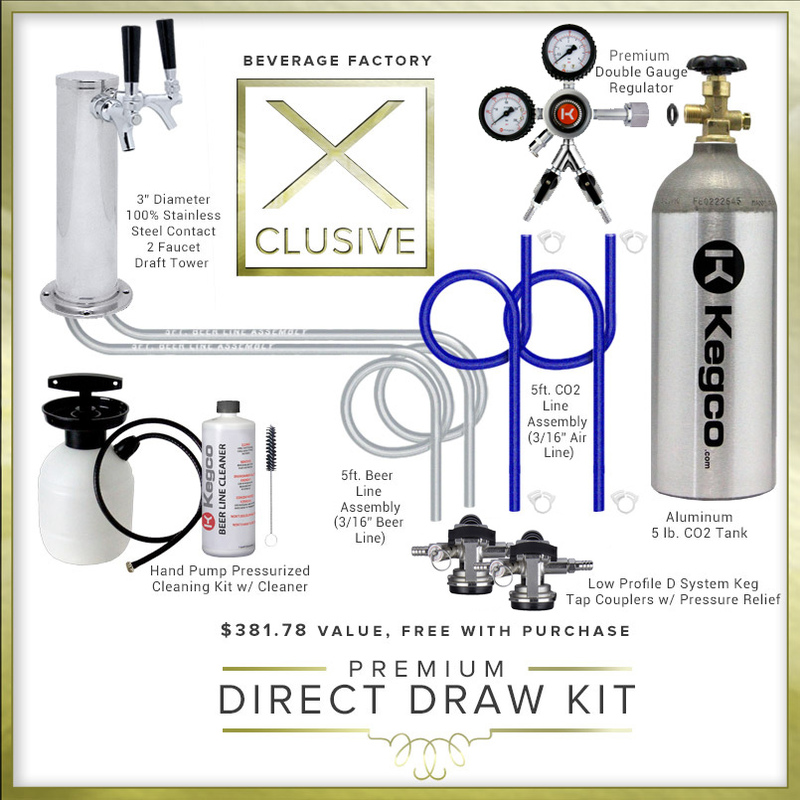 This two product kegerator comes with the BeverageFactory.com X-CLUSIVE double faucet stainless steel draft tower, two D system sankey keg couplers, a Premium Pro double gauge two product CO2 regulator, a 5 lb CO2 tank and all the hoses and washers necessary to dispense two kegs. Note: Doors are not Field Reversible. Hinge side must be specified at time of order for this unit. If you require a left hinge unit please call us. We are draft beer experts. All draft beer and custom home bar installation questions related to this kegerator are handled toll free (1-800-710-9939) by one of our friendly and experienced staff. 24 inches wide (34"H x 23-7/8"W x 24-3/8"D), 140lbs, 6.1 cu.ft. This kegerator can fit one Full Size, Pony or Quarter Slim Keg, two 5 gallon commercial kegs and up to three 5 gallon Cornelius home brew kegs.